Today’s Network Break issues a few corrections, and then delves into hybrid cloud news from Google and Cisco, examines a new SD-WAN service from Juniper, discusses Sungard’s bankruptcy, and other tech news. On today’s Network Break we examine new product announcements from Aruba and Intel, discuss Amazon’s plans to launch broadband satellites, analyze Kemp Technologies’ acquisition by a private equity company, and more tech news. Take a Network Break. This week we analyze how ASUS got spanked by clever attackers, lazy software patching from Cisco and Huawei, a new venture firm funded by Cisco to spur enterprise startups, the latest release of OpenDaylight, and more IT news. Today’s Network Break looks at Facebook’s plaintext password blunder, Nokia’s new investment in the IETF, the potential impact of Google’s gaming service on broadband, new products from VMware and Dell EMC, and more tech news. Today’s Network Break discusses new Facebook switches released through the Open Compute Project, examines two significant acquisitions–F5 buying NGINX and NVIDIA ponying up for Mellanox–and reviews more tech and IT news. Network Break 225: Juniper Buys WiFi Startup Mist Systems; Huawei Sues The U.S.
Today’s Network Break analyzes Juniper’s $405 billion purchase of WiFi vendor Mist Systems, discusses VMware’s new service-defined firewall, digs into the launch of a new security analytics service, opines on Huawei’s lawsuit against the U.S., plus more tech news. Today’s Network Break examines a ETS, a proposed alternative to TLS 1.3 that enables decryption, looks at ICAAN’s call for DNSSEC everywhere, discusses new products from startups Volta Networks and Veriflow, and much more tech news. Today’s Network Break examines Google’s new hybrid cloud beta release, Palo Alto’s acquisition of security orchestrator Demisto, research by Duo Security on Chrome browser extensions, and more tech news. Today’s Network Break covers a brand new network OS from SnapRoute, new features in VMware’s SD-WAN appliances, Carbonite’s acquisition of Webroot, Cisco and Arista financial results, and more tech news. Today’s Network Break podcast analyzes Cisco’s call for privacy legislation and CEO Chuck Robbins’ assertion that privacy is a human right. We also dive into VMware’s revamped recertification policy, a new Sprint/Meraki partnership, tactical Azure Stack hardware, and more tech news. Today’s Network Break analyzes a slew of Cisco Live announcements including ACI Anywhere and HyperFlex for edge deployments, Huawei’s run-ins with U.S. prosecutors, financial results from Juniper Networks and Mellanox, and more tech news. Today’s Network Break examines a US Homeland Security advisory on DNS tampering, covers 400G switching news from Arrcus and Huawei, analyzes financial results from Intel and F5, and more. Plus stay tuned for a sponsored Tech Bytes conversation with Nubeva about its cloud packet broker. Today’s Network Break analyzes a new AWS backup service, Rubrik’s latest infusion of VC cash, whether the tech sector has reached its natural growth limit and what that means for how tech companies are valued, a Juniper/IBM deal, and more. Today’s Network Break podcast forecasts 2019 IT trends, analyzes new industry reports on IT spending, reviews the continuing fallout from Ericsson’s outage, detects a bit of consumer backlash against gadget surveillance and more tech news analysis. Happy new year! Today’s Network Break episode analyzes key themes and tech trends from 2018, and looks ahead on what might influence and affect IT and tech in 2019. Ethan Banks joins as guest prognosticator. 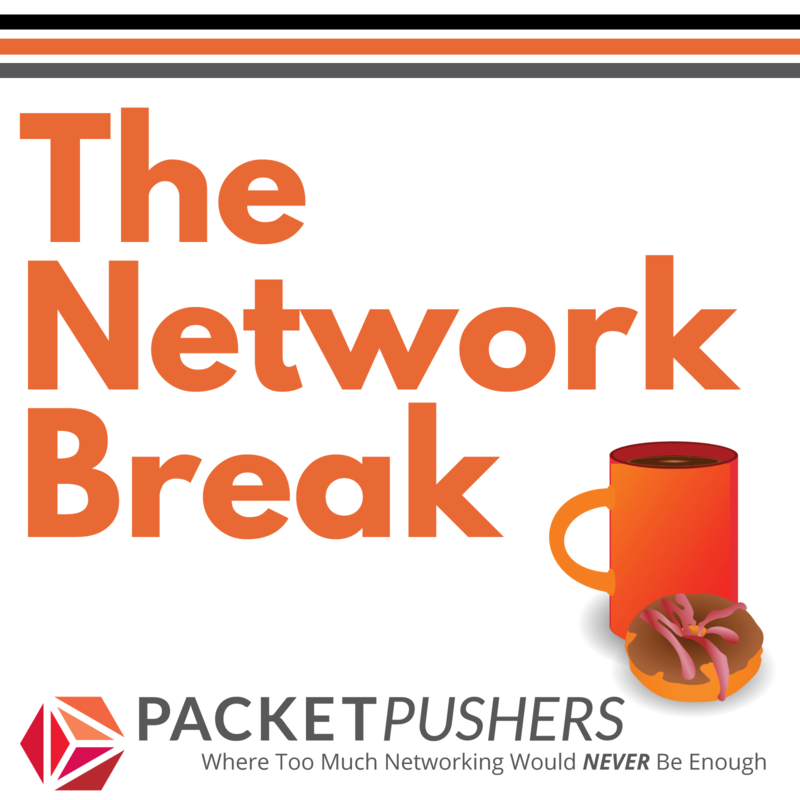 On today’s Network Break we analyze Dell’s move back onto the public market, Arista’s partnerships for container networking, startup funding, new products, and more of what’s happening in IT. Today’s Network Break podcast analyzes the latest rounds of trouble for Huawei, new silicon from Barefoot Networks, two service mesh announcements from F5 and VMware, and more. Denise Donohue joins as guest analyst. Today’s Network Break analyzes the impact of AWS announcements including Outposts and Transit Gateway, Juniper’s HTBASE acquisition, VMware’s Q3 financial results, and more of what’s happening in IT. On today’s Network Break we get more insight into recent Cisco news on SD-WAN and WLAN controllers, discuss Google Cloud’s curious choice for a new boss, examine the U.S. government’s latest move against Huawei, and other tech news. On today’s Network Break we examine why Oracle bought an SD-WAN vendor, discuss new Cisco switches and its new SD-WAN strategy, opine on BlackBerry’s billion dollar security purchase, and more tech news. VMware and Cisco make moves to stay relevant in the age of Kubernetes and the cloud, Dell EMC releases new ToR switches with an odd lack of fanfare, Cisco releases another security advisory, and more tech news analysis from the Network Break podcast. Cisco throws its hat in the 400G ring with switches built on two different ASICs, IBM buys Red Hat and the tech industry says “Good luck with that,” Pica8 and Dell partner on campus and edge briteboxes and more tech news analysis on this week’s Network Break. Today’s Network Break news review looks at Apple’s demand for a Bloomberg retraction, Arista’s new 400GbE switches, the sentencing of an Equifax engineer for insider trading, quarterly financials from Check Point and Juniper, and more tech news. Guest pontificator Tom Hollingsworth joins Network Break to discuss the latest Bloomberg hardware hack story, Juniper’s embrace of multicloud, a new NAT service from Google and other tech news.